Gaps are a normal part of a wooden floor. Wood is a natural product and responds to environmental influences. Changes in humidity can make gaps appear - and it is not unusual for the boards of a floor to expand and constrict with the seasons. In some floors, gaps are not only unsightly but can encourage draughts, especially on the ground floor. 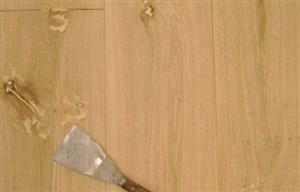 Gap filling is therefore an option during the sanding and restoration of your floor. Larger gaps may be filled with fillets of wood. Small gaps of up to 6mm between floorboards and parquet blocks my be filled with a resin. We mix the fine clean dust from the final sanding with clear resin - and apply between the gaps. It dries to the same colour as the floor - which is then finished with the sealant of your choice. The floor enjoys an even and uniform appearance. Very small gaps and cracks can be filled with a proprietary gap filler. of floors of every type and from every level of condition. Ask us about the feasibility and desirability of filling in gaps during your free assessment. Please be aware that we cannot guarantee that filling the gaps will last. Floors are subject to natural movement - and this can cause the resin to crack and splinter.